Want to create WordPress newsletters directly on your site? If you aren't sending very many emails, you can send newsletters with MailPoet instead of a service like MailChimp. Create newsletter signup forms in Formidable, and those who submit the form will be added to the newsletter lists. If you haven't already done so, install and activate Formidable Forms. In your WordPress admin, go to 'Formidable' → 'Add-Ons' and click the 'Install' button for the Formidable MailPoet plugin for WordPress newsletters. Now that the MailPoet and Formidable MailPoet newsletter plugins are activated, set up a form to add users to a newsletter. Go to the form settings page for the form you will be using to subscribe users to a newsletter list. Click on 'Settings' → 'Form Actions' → 'Add to MailPoet' icon. Select the MailPoet list that you would like to add subscribers to. Select the Email Address, and any other required options. 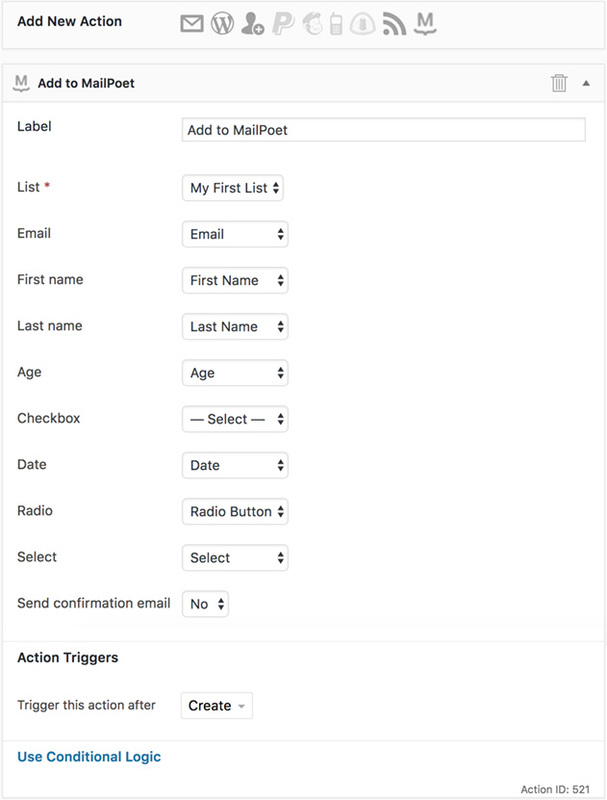 If you add custom fields on the MailPoet -> Forms page, they will also appear in your MailPoet form action. Send confirmation email: This enables double opt-in. If turned on, new subscribers will receive a confirmation email with a link to activate the newsletter subscription. If the link is not clicked, the subscriber will remain 'unconfirmed' and will not receive any newsletters. Learn more in the MailPoet docs. Send welcome email: If you are using the premium version of MailPoet 3, you have the option of sending a welcome email. Learn more about this from the MailPoet team. Trigger this action after: Select 'Create' if you would like the user to be added to the newsletter list when they submit the form. Select 'Update' if you would like them added when the entry is updated. Conditional logic can be used to add a user to the newsletter list only if specific conditions are met. Please note that Conditional Logic is only available in the Pro version of Formidable Forms.